The Uninvited Visitors (Starfoot and Brown Books) (Volume 2) by Rhoda Canter is a children’s book full of fantasy, fun, and laughter because the animals talk and come to life. Chihuahuas Sergeant Starfoot and Chief Inspector Brown work together to solve the mystery about the two uninvited visitors on Bald Head Island. One day Isabel Hamidi’s father, Reza, a noted nuclear physicist visiting professor at the university, told her that he must return to Tehran because he may be forced to continue the nuclear program. He believes that the only thing that can force his hand is his daughter, so he told her that she must disappear completely and tell no one, not even him of her whereabouts. The plan is for Reza to send a text message with one word “boson”: this will be the code to vanish. Jordy Jordan is an interesting boy that went on a field trip one day to Bald Head Island. He was left on the island because he began to wander off, communicating and being fascinated with the mockingbirds, dogs, and other animals roaming around. As luck would have it, Isabel heads to Bald Head Island to complete her disappearing act when she encounters Jordy and the animals - and then the adventure begins. 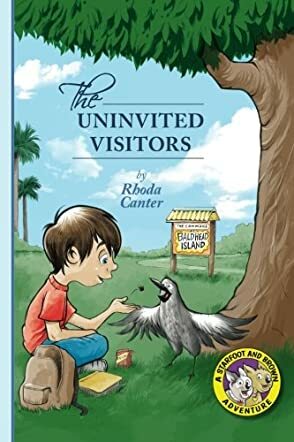 The Uninvited Visitors by Rhoda Canter is an interesting story that puts you in mind of Dr. Doolittle because of the wonderful mixture of animals throughout the book. To witness the intriguing character of Jordy and his interactions with and mimicking the sounds of some of the animals, particularly the mockingbirds, will make you wish that you were there. Children of all ages will definitely love becoming enthralled in this story because of the fantasy, excitement, and amusement that it brings.